This film comes at a sad time for hockey. As this is being written (in late August, 2011), three of hockey`s enforcers have taken their own lives. A comedy that`s based on just such a character may have trouble finding an audience. Goon centres on Doug Glatt, (played by Seann William Scott) the black sheep of an illustrious medical family who is working as a bouncer when he gets roped into going to a local hockey team`s game by a fanatic pal, Pat (Jay Baruchel). When Pat incites the opposing team`s enforcer to come into the stands after him, Doug steps in and to everyone`s surprise, especially the local team’s coach, quickly puts the player down. Invited to a tryout he is taken on and eventually acquires a modicum of skill while crushing every opposing goon in the league. This attracts the attention of the Halifax Highlanders, the cellar dwellers in a league another rung higher in the hockey universe. 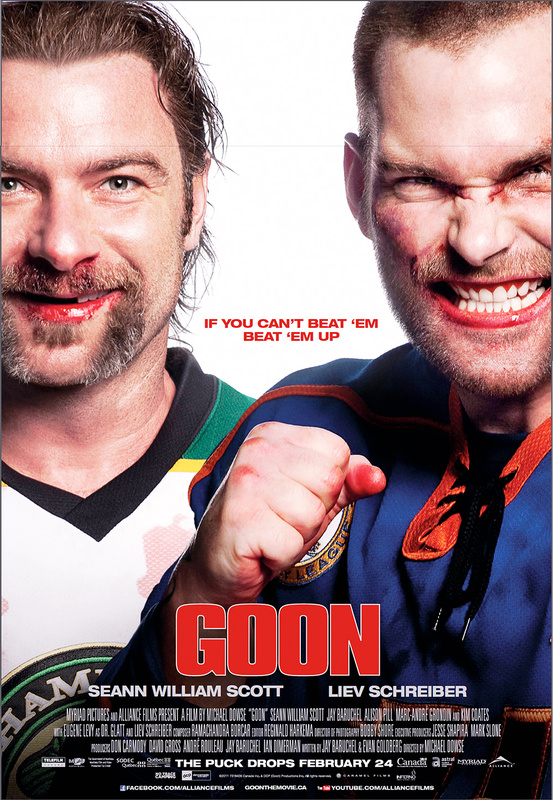 They desperately need a goon to protect their star player, Laflamme (Marc Andre Grondin), who has been sent down from the big show, having lost his nerve after a brutal altercation with a goon named Ross Rhea (Liev Schreiber). Laflamme succumbs to drinking and carousing instead of getting his mojo back and the Highlanders feel the only way to kickstart his recovery is to get him his own body guard. They trade for Doug and a very odd couple is born. But this is a much tougher, more professional league with bigger, badder enforcers all gunning for the new boy. A penultimate challenge is launched when Ross Rhea is also sent down to the minors after yet another violent attack on a player. Recognizing that due to his age and the league`s decision to send him down, his days as a professional hockey player are coming to an end, Ross Rhea wants to go out in a blaze of glory by taking down the new kid.